Seeing that the repairs would take some time to complete, some 5,000 passengers were instructed to leave the carriages, which were stopped in an empty stretch of the tracks, and walk to the nearest station, as directed by JR staff who were on the scene. Even in Japan, which is known for having one of the world’s supposedly most “punctual” train systems, delays and incidents can occur. Last week in Kobe, this was the scene on the city’s main JR rapid transit line after an incident with an overhead power-line was found, requiring a full shut-down of the system in Kobe and service disruptions throughout the 194km-long intercity rapid transit line. If this sounds familiar, that’s because it does resemble some of the incidents that have plagued our SkyTrain system here in Metro Vancouver over the past few years. I’m also sure many of you are aware of what happened to the SkyTrain yesterday (November 24th), when it was shut down in downtown due to a “power failure” incident that turned out to be a ‘one-in-a-million’ misplaced replacement rail part that moved on the tracks and struck/damaged the power shoe of an oncoming train. 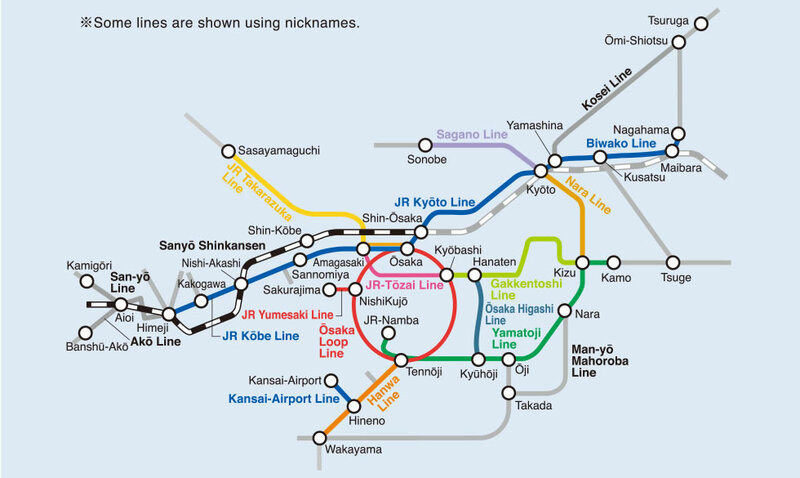 [OPEN to enlarge] Map of JR train lines in the Osaka/Kansai area. 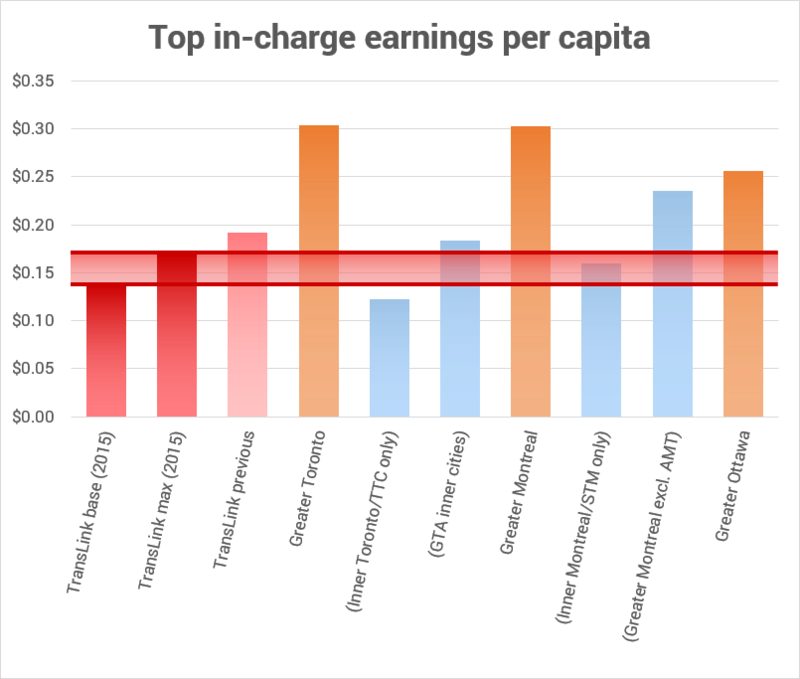 The blue line from Himeji in the west to Maibara in the east was the line affected. I was in Japan last week and happened to actually experience the Kobe incident in the video at the top of this post, although I wasn’t in Kobe when it occurred. Instead, I felt the ripple effects over 140km away at Maibara Station, on the eastern end of the line, as I transferred from another train from Nagoya intending to ride this particular line en route to Kyoto. The featured photo at the very top of this post is my own picture of the “trains delayed” notice display I ran into when I arrived at Maibara Station. I could feel my stomach churn even more when I checked the departure time-boards on the station platform itself, which showed that westbound express trains had been completely cancelled. This left me and perhaps several hundred other passengers waiting on the platform before having to crowd onto a smaller local train, which we would ride until another station down the line (Yasu) where express trains would re-commence. The incident was uncomfortable, cost me nearly 90 minutes in delay and had a major effect on my plans for the day. This is, incidentally, longer than the approx. 60 minute delay I experienced yesterday when I was caught in yesterday’s SkyTrain delay. I started commuting from Surrey to the Main St. Station area to fulfill an errand, right after delays began at around 2:50PM. I went through stopped trains, crowdedness of the trains and crowded-ness again when I boarded a replacement shuttle bus at Commercial-Broadway Station. SkyTrain has been through numerous shutdowns in the past year, which many have attributed to be an issue of system reliability. In actuality, many of them the result of the lack of an auto-restart system that was neglected by BC Transit in the 1990s; some of them were genuinely due to human error; and some of them just couldn’t be prevented no matter what anyone did. Regardless of the cause, we don’t seem to handle these very well. Doors have been broken open, resulting in people walking on the tracks unauthorized and causing further delays as track power needs to be shut down. People tend to respond loudly and angrily on social media, not waiting for the investigation to blame TransLink on whatever happens. There’s a lot that we can learn from the Japanese when incidents like these happen. In Japan, trains are so critical to the functions of life, responsible for moving millions of people every day in a very dense country. Punctuality is considered very important, and so train operators concentrate on providing the best service possible when everything is working. It’s important to understand that things can sometimes not work – and when that happens, instructions have to be followed and anger has to be calmed. 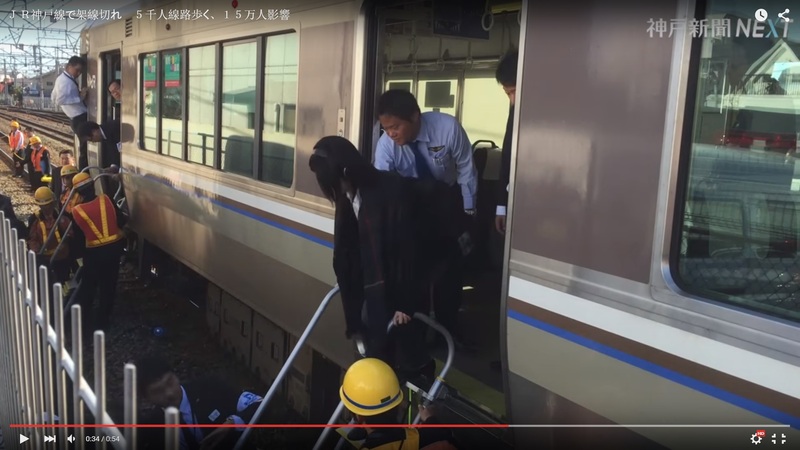 Which is why the train evacuations showcased in the video were so smooth and orderly. This train line didn’t have emergency walkways at door-level like our SkyTrain system – so passengers had to climb down ladders to get onto the track. The most important thing to remember is that at the end of the day, these incidents don’t actually happen that often – SkyTrain has maintained a statistical reliability that tops transit systems in other cities. I pride myself over having kept myself calm throughout yesterday, and hope that other passengers who were able to do the same do so as well. We can’t let these incidents affect the way we think about transit and play our part in shaping major transit decisions, like the recent NO vote on the regional transit referendum. It’s easy to lose sight of the facts when you’re inconvenienced and made bitter, but at the end of the day, in doing you really aren’t helping anyone. I’m noticing many commuters on Twitter talking about how reluctant they were to take SkyTrain today. If I had let the incident from last week stop me from using the JR train line again out of fear, I wouldn’t have been able to resume with my plans to visit Himeji Castle and take these gorgeous pictures…. 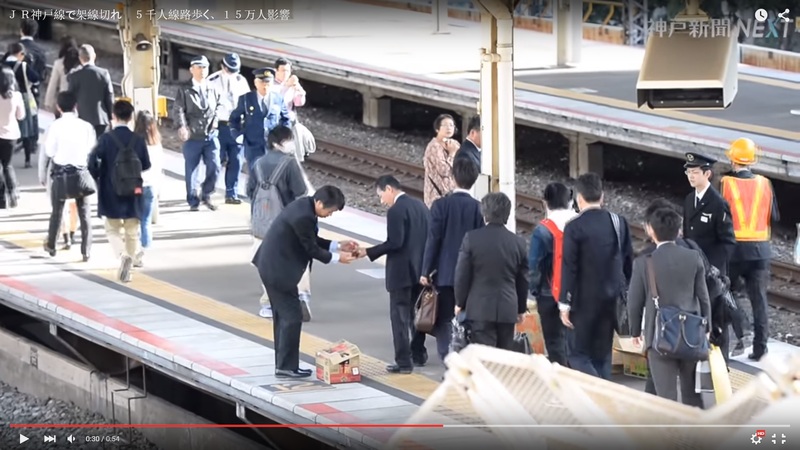 …we think what really sealed the deal is the Japan Railways representative who shows up on the platform at the video’s 0:27 mark, ready to apologize to those who were inconvenienced and hook them up with bottles of tea, which he opens for each person who walks by. Because hey, on the occasions when you can’t be punctual, you may as well be classy. The next CEO of TransLink will earn an annual salary of almost $320,000, plus a generous benefits and bonus package. The new salary offer for TransLink’s next CEO is out and as expected, members of the public are complaining non-stop about a number that is being described by media as “massive” and “fat” as it is north of $300,000. Earlier this year I wrote a blog post suggesting TransLink’s executive pay should be looked at in a different way, a post that was so well-received that it engaged the entire region and sent the page-view counts on this blog skyrocketing. When transportation professionals with the Victoria Transport Policy Institute quoted this blog post in a major study of theirs, I knew I had hit something right on the nail. The “all” in the above chart represents all transit authorities servicing a given area. As an example, in addition to Toronto being serviced by the TTC, Mississauga is managed by Mi-Way; York Region is managed by York Regional Transit; GO Transit operates regional commuter rail and a TransLink-like regional authority called “MetroLinx” is required to tie them all together. Each of these operators has their own executives and CEOs. Our region has 1 transit operator with 1 CEO; others have many different operators and multiple CEOs. It’s a concept that’s so simple and easy to understand, and it is absolutely crucial that we familiarize ourselves with it. When TransLink’s context of a single, region-wide transportation authority is considered against what the region-wide setup is in Canada’s other metropolitan areas, Metro Vancouver actually has the lowest per-capita CEO salary of any major city in Canada. Even if our CEO receives a full 30% bonus. 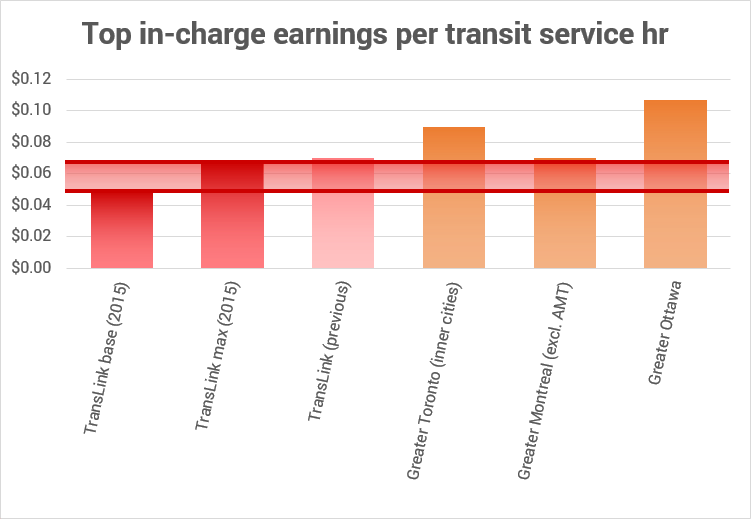 We now pay about 17.5 cents per capita if the CEO earns a 30% bonus; whereas the people of greater Toronto pay between 1 and 12.5 more cents more for their executives (depending on what you would include as greater Toronto’s transit operators), and the people of greater Montreal each pay between 6 and 12.5 cents more. The revised, lowered CEO salary will put a maximum of 5 cents back into people’s pockets and would not even pay for buying a single bus. Despite the relatively minimal benefits to Metro Vancouver’s citizens, attracting a new CEO will be a more difficult task with a lower offer, and TransLink should be commended considerably if and when they are able to do so. But, I don’t think most people are ready to understand this – it’s probably easier to think that our transit operator is a transit operator like any other, regardless of the serious differences in the way we are organized. It’s clear that much of the “NO” vote in the recent referendum was motivated by an unfavourable view of executive salaries, which were not being looked at in a proper context. If anything, this should have an effect on how the provincial government interprets the “NO” vote altogether. 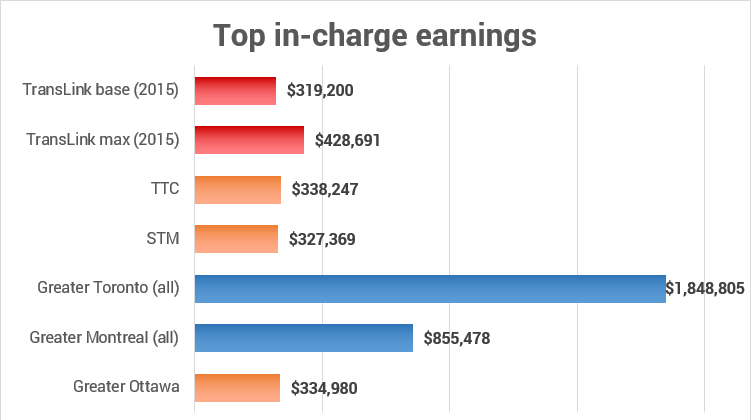 At this point, the only way that the misinformation around executive salaries in this region can be offset is for someone to take leadership and recognize the serious flaws in how people have been informed on this matter. Author’s note: This post was updated on July 27, 2015 to account for newly released numbers and other issues pointed out with the original post. Global Television reports that the City of Edmonton has deceived its residents on the service frequency of its new LRT line. The 3.3km “Metro Line” LRT has already been a victim of multiple delays. It was initially planned to open last year (2014), but has passed opening deadline after deadline, including the latest deadline which mentioned the line would open in May (it is now June). Despite having more on-street segments than previous LRT extensions, it has cost more per km than the fully grade-separated SkyTrain Evergreen Line. And now, in order to “open the new line faster”, trains on the new LRT line will be running at just every 15 minutes, less than half the initially promised frequency on opening day. In addition to that, the line will not run its full length during off-peak hours, requiring a lengthy transfer for all transit passengers looking to get from one end of the line to the other. Opening the Metro Line will also require a frequency reduction on existing LRT, on the north portion of the existing Capital Line LRT. From an existing peak service of 5 minutes, the Capital Line to the north will now run at an “alternating frequency of 5 or 10 minutes”, seriously inconveniencing existing riders. Apart from the reduction in service, the arrangement has received significant criticism for potentially confusing passengers as they face changing service patterns – and in some cases, totally removed service. So we’re going to have a 10-minute frequency after hockey games at Rogers Place and they’re only going to be three cars in length. That’s insane. How are you going to fit all those people on there? To make matters worse… once the Metro Line finally runs on its regular schedule, the trains will be running every 10 minutes – half of the initially promised 5 minute frequency. This flies against comments made by Dorian Wandzura, Edmonton’s general manager of transportation services. In January, he said that trains on the Metro Line would be running every 5 minutes – and that trains on the combined section with the Capital Line would then be running every two-and-a-half minutes apart. Each train running down the Capital Line is five minutes apart. When you integrate the Metro Line it will be running two-and-a-half minutes apart. The reason this isn’t happening apparently has partly to do with safety issues running LRT trains every 2.5 minutes, on the combined section from Churchill to Century Park. But it also has to do with patronage – ridership levels obviously do not demand LRT trains every 2.5 minutes, permitting the lower frequency. Should council in the future decide that people, residents want more service then we could by all means order more trains. To conclude, it would appear that the city-owned Edmonton Transit System has abandoned its initial service promise – as if there was never an intent to run trains at the promised frequency of 5 minutes, deceiving everyone who has been looking forward to using the new line. Surrey’s proposed at-grade LRT system will face a similar segment requiring interlining of LRT trains, between King George Station and Surrey Central Station. This is required so that trains from Fraser Highway can have a through service to Surrey Central, where City Hall, City Centre Library and the SFU and upcoming KPU campuses are located. Trains on each of the two LRT lines are promised to run every 5 minutes, according to the City website. That means they will be running every 2.5 minutes on the combined, on-street section to Surrey Central. If the City of Surrey were to face the same issues as Edmonton, it could mean some unprecedented and unacceptable service changes to riders. As an example, trains from the Fraser Highway line might be required to terminate at King George – necessitating that all riders transfer to other LRT or SkyTrain service in order to reach SFU or City Hall. Neither the City or TransLink have specified how Fraser Highway line trains will be turned around at Surrey Central Station, without impacting the service of other through trains (such cases generally require larger stations with multiple platforms). A SkyTrain extension down Fraser Highway would be integrated with the existing Expo Line, offering through service without transfers to Surrey Central and as far as downtown Vancouver, with an end-to-end travel time of 59 minutes from Langley Centre to Waterfront. Unfortunately, the city has no plans to accommodate a SkyTrain extension. The new Metro Line LRT will have its frequency reduced from the get-go from 5 minutes to 10 minutes. I can only imagine what kind of disdain that would cause among transit riders in Surrey, if a similar reduction were to be made for LRT on opening day (which would make the new LRT less frequent than the 96 B-Line was at introduction!). It’s also noteworthy that Edmonton’s Metro Line will be opening more than 1 year behind schedule when it finally does open. Despite its relative shortness (3.3km), it has been under construction since 2010. It took 3 years to build out the Metro Line by July 2013, after which trains began testing for approximately 1 year. By comparison, our city Mayor Linda Hepner expects (having actually promised it during her election campaign) that the first phase 10km Surrey LRT will be complete in 2018. This would require construction and testing to begin and end within 3 years, which has never been done in North American history; and if the Edmonton timeline says anything, it says that Mayor Hepner and the Surrey First party are going to be in trouble during the next elections. No rail rapid transit project in Canada has ever made it from absolute zero (with no detailed design work completed at all) to project completion within the timeline expected for Surrey LRT. Clearly, the City of Surrey is on track to face a comparable disaster with its upcoming LRT system. Taxpayers, voters and city stakeholders have already been cheated multiple times by the misleading from LRT supporters. It would be wise and best for Mayor Linda Hepner to abandon her LRT promise now with an apology note to City residents, than face accountability for her failed promise closer to the next municipal elections. 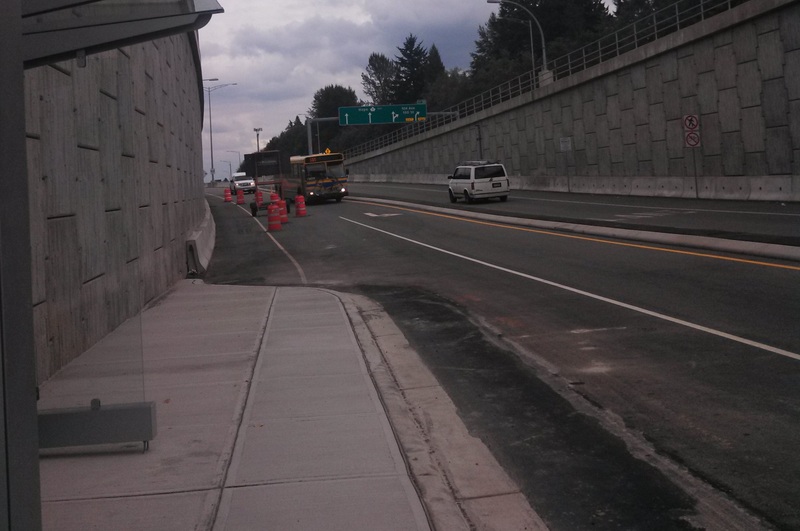 A bus approaches the new 555 stop at Highway 1 and 156th Street, giving Surrey residents improved access to Greater Vancouver. Coun. Tom Gill, who chairs the city’s transportation committee, said the bus stop materialized thanks to the relentless campaign by 18-year-old Daryl Dela Cruz, who on his website, describes himself as a technology fan, a transit user, a researcher and a community issues advocate. Gill describes him as a “outspoken, very smart, intelligent young man” who inundated Gill and the committee with well-argued facts supporting the need for the bus access. As for what’s the story now, the #555 bus from Braid Station to Carvolth Exchange in Langley, stopping at 156 Street in Surrey, has received a service increase. Buses now operate every 7-8 minutes in the AM peak period, responding to increased demand as a result of a popular 156 St stop. They previously operated every 9-10 minutes. The service change was confirmed through a schedule change in the 555 schedule posted by TransLink on its website. The materialization of this service increase may have had to do with a citizen effort I was informed about, called #555passup, to inform TransLink of the growing service needs and pass-ups on the 555 route that would result in Carvolth passengers being told to wait for the next bus by TransLink security, to make room for riders boarding at 156th Street. It would seem that much of the efforts were spearheaded by a local rider named Donald Nguyen. All in all, with only a couple of weeks having passed since the stop’s opening, it looks like my efforts have definitely not gone to waste – and neither have these riders’, to improve the new service provided for them. It thrills me to see that I have given hope in citizens and may have started new trends in citizen-lead transit improvement advocacy. As the improvements materialize, Surrey residents are realizing significant benefits of a new bus stop that really should have been built in the first place – and with demand increasing, funding will soon need to increase further so this service can keep up with the high demand. Having seen citizens come up with innovative ways to advocate for smaller-scale improvements gives me hope as well – hope in a larger-scale effort we’re going to need to have in order to push the big improvements in transit funding the entire region needs. The question now is, how can we expect the authorities in charge of funding – specifically, the provincial government, who have also explicitly tied the introdduction of any new sources to a referendum – to be responsive, if at all, to our concerns.